One of the most appalling betrayals in recent history slipped by unseen by most people in last week’s media. The UK Government stated that Tibet has actually always been a part of China, and that it has no claim whatsoever to be viewed in anyway differently from the rest of China. For the Tibetan people, who have suffered genocide, the suppression and erosion of their cultural and religious identity, huge population transfer, famine and police brutality, this is the final kick in the teeth, the final glimmer of hope snuffed out. The fact that that the Olympics are over, and China can stop pretending again that it gives a toss what the rest of the world thinks about anything, coupled with Western governments’ decision that the way out of crippling recession is to spend, spend, spend in order to encourage us to spend, spend, spend, means that no-one needs Tibet. It is dispensible and can now officially crawl away and die slowly. This is a disgusting betrayal. A short history lesson. The histories of Tibet and China have long been intertwined, sometimes parts of Tibet were part of China, and sometimes vice-versa. Tibet lead a very isolationist existence for hundreds of years, it wanted little to do with the rest of the world, and didn’t sign the kinds of treaties and accords that would identify its sovereignty in international law, yet its culture, language, traditions, dress, music, architecture, religion and politics were always entirely distinct from that of China. In 1950, China invaded Tibet. Between then and 1959 it tightened its grip on the country, especially on the East of the country, what was called Amdo province, but which the Chinese rapidly absorbed into China, calling it Quinhai province. By 1959, the tensions in Tibet had reached breaking point, and an uprising broke out in the capital, Lhasa. In the resultant confusion, the Dalai Lama fled to India, and between 10 and 15,000 Tibetans were slaughtered in Lhasa in a period of just 3 days. In Central Tibet, between March 1959 and October 1960, 87,000 Tibetans were killed by Chinese forces tightening their grip on the country. During the 1960s, agricultural reforms that dictated that China needed plants that struggled to grow in China led to widespread famine across Tibet. The Cultural Revolution led not just to increased carnage in terms of the many thousands of Tibetans exterminated in ‘struggle sessions’ and in prison camps, but also the most appalling cultural carnage. Before the Chinese invasion, Tibet was home to over 6,000 monasteries, an extraordinary treasury of ancient Buddhist artifacts, manuscripts and ancient buildings. By the end of the Cultural Revolution, during which young radicalised Maoists tried to eradicate all traces of the past, only 13 were left. The huge monastic cities of Sera, Drepung and Ganden were shelled with cannons for weeks until all that remained were stumps in the landscape. Tibetans were forced to use holy scriptures as toilet paper, to murder their teachers, and to actively desecrate religious icons, melting down any valuable ones and sending the bullion to China. Prison camps in the north of Tibet were set up, hundreds of miles from anywhere in the vast desert regions, home to over 10,000 prisoners, forced to work in borax mines in dreadful conditions. The Panchen Lama (second only to the Dalai Lama), speaking in Beijing in the late 1980s, said that “in Amdo and Kham, people were subjected to unspeakable atrocities. People were shot in groups of ten or twenty… Such actions have left deep wounds in the minds of the people”. 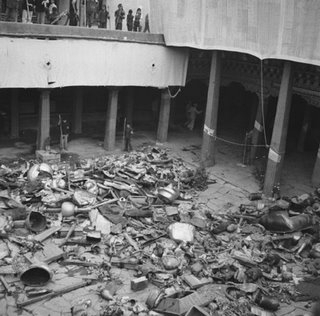 All of this was inflicted on the Tibetan people in the name of ‘liberation’ and ‘democratic reform’. Estimates vary, but it is thought that at least 1.2 million Tibetans have perished since 1950, one of the worst cases of genocide since World War Two. Until the mid-80s, Tibet was closed to the world, with reports emerging only from those brave enough to make the journey across the mountains to India. Then in September 1987, the city of Lhasa saw major demonstrations, hundreds of monks protesting at the treatment of their people. This and subsequent demonstrations were ruthlessly suppressed, with the head of security for the Tibetan region, who visited shortly afterwards, praising the ‘merciless repression’. While we in the UK are rightly indignant at the idea of 42 day detention without charge, in Tibet people can be detained for such charges as speaking with foreigners, singing patriotic songs, putting up posters, or having images or recordings of the Dalai Lama, or even speaking favourably of him. It can be months after being detained that one is even formally arrested, and often it is down to relatives of those detained to track their loved ones down. The Chinese have also embarked on a vast programme of population transfer in order to break the back of the Tibetan identity. The city of Lhasa has been all but completely rebuilt. Aside from the key tourist sites like the Potala Palace and the Jokhang temple, most of the Tibetan housing has been replaced by Chinese housing. 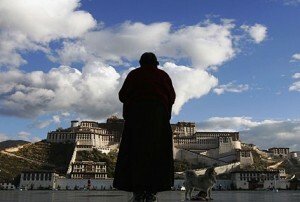 Tibet operates like an aparthied state. Most good jobs go to Chinese, and most businesses are owned by them. When I went to Tibet in 1991, in a town just half an hour north of Lhasa, I only saw one example of Tibetan writing, and all the shops were owned by Chinese people. It was a deeply saddening experience. The attitude of the world towards Tibet has depended largely on what it felt it could get out of China at any given time. Initially the CIA funded a small Tibetan guerilla group, but that ceased when the US started making overtures towards China during the Nixon era. China was a vast potential market for Coca-Cola, and has rapidly become the world’s great sweatshop, the source of most of what is for sale in the West’s shops, as we in turn have closed down most of our own manufacturing. The Dalai Lama has for 50 years led an increasingly lonely mission to try and get Western governments to recognise the rights of the Tibetan people. Quite early on he relinquished the idea of Tibetan independence, speaking of Tibet being given greater autonomy, but within China. The Chinese have refused to budge on anything, and as China’s economic might has grown, Western governments have become increasingly obsequious and fawning to Chinese interests. The tolerance of the behaviour of the ‘guardians’ of the Olympic torch in London recently was one indicator of this, as was Gordon Brown’s refusal to meet the Dalai Lama on his recent visit to the UK, but the recent statement finally recognising Beijing’s direct rule over Tibet is an utter disgrace. Take a look at Zhu Weiqun telling the BBC that the UK has merely finally seen sense and fallen “in line with the universal position in today’s world”. Tibetans, he said, are China’s ‘brothers and sisters’. This is patently nonsense, the following film offering but one insight into why. When I went to Nottingham earlier this year to see the Dalai Lama, there was a pro-Chinese protest outside, an extraordinary sight, of young Chinese students clearly with no grounding in the history of the Tibet/China issue, protesting that the Dalai Lama wants to ‘split the Motherland’. As the energy peak-underpinned recession deepens and continues to bite, Gordon Brown’s pitch to the G20 meeting was the need to increase borrowing and cut interest rates in order to stimulate economic growth. This is akin to offering fresh carrots and a thorough whipping to a horse that just died from exhaustion. China is of course key to this. If the world is to spend its way back to economic health it needs the Chinese. It needs their cheap trainers and toothbrushes, their un-unionised factories and low wages. It also needs their money, the vast amount of currency they have stashed away after the recent years of growth. Finally, it needs their energy, given the phenomenal rate at which they have been buying up energy resources around the world in recent years. In short, when you are utterly dependent on someone, you find it both easy and convenient to overlook their obvious flaws. It is easy to see why the Dalai Lama recently spoke of ‘losing hope;’ for the future of Tibet. The world needs China. It doesn’t need Tibet. If the world is to pursue a path of continuing to believe that economic growth and economic globalisation have a future in spite of all the evidence to the contrary, then we merely deepen our reliance on and our need to turn a blind eye to the atrocities perpetuated by those on whom we become increasingly dependent. A world in which countries and economies were more resilient, less dependent on international trade and less dependent on imported energy, more self-reliant and more resourceful, would be one in which one could actually have an ‘ethical foreign policy’. At present, to speak of such a thing is laughable. In Gordon Brown’s growth-fixated worldview, having China on board is essential. Tibet is, once again, paying the price for not having oil, for not having asserted its independence in the 1940s, and for having been invaded by one of the world superpowers. Now it has been officially decided that the Tibetan people can sod off, that the world will do nothing about the ongoing eradication of their culture, that they have no-one to turn to as China continues to import hundreds of thousands of Chinese into Tibet and to brutally suppress any opposition. When people suggest that building resilience and becoming less dependent on economic globalisation somehow sentences the developing world to poverty, Tibet is just one of many examples of places for whom the demise of our addiction to China means that finally, the world may actually find its voice in terms of speaking out on the ruthless and relentless eradication of one of the world’s great cultures. This whole nightmare scenario is at least coming to a head. As well as pouring our energies into local Transition, let us not forget the global picture and give communities and, in this case, nations our support. I do not agree that Tibet’s culture is being eradicated. Like so many people around the world, I deeply lament and mourn the atrocities inflicted on the Tibetan people by the Chinese regime now and in the past which have caused such unbearable suffering. Also, far more contoversially in terms of world opinion, I share with the author of this article very many fears about the dangers of economic growth and globalisation. But for all that, Tibet’s heritage to the world is safe and very far from forgotten. Tibet’s greatest gift to humanity lies in its outstanding spiritual heritage which is now thriving all over the world. The horrific events in Tibet in the 1950s triggered a diaspora in which many Tibetans fled across its borders and established new centres of Tibetan culture and learning abroad. Amongst these refugees were some of Tibet’s finest minds, best scholars, teachers and spiritual practitioners, together with their sacred texts and teachings which in many cases survived only because they had been learnt by heart. These extraordinary gifts and legacies are now becoming available to us all. Far from being forgotten, the tragic events in Tibet have brought the country into the international spotlight and made it one of the greatest global “causes celebres” for human rights. It is this cause which we should champion – the rights of people to practise and share their own cultural and spiritual traditions freely and without fear of persecution. In this respect, the Tibetan people have acted and continue to act as a beacon for all of us. The world needs Tibet and Tibet needs the world! I agree. The world needs Tibet more than it needs China. Tibet’s extraordinary spiritual tradition offers us far more useful skills in terms of self-reliance and personal resilience than the economic/material offerings that China is supplying. Tibetan Buddhism can teach us how to tame the grasping mind that causes us to want so much in the first place. Through meditation we can learn to enjoy life with less need for consumption and grasping after material possessions and live a richer, simpler life. How ironic at this crossroads in human history that most of the world’s leaders choose China’s economic benefits over something that could be of far greater and longer lasting value. What the UK Government has done is appalling and should not be tolerated. The west did go to Iraq to get rid of Sadam Hussein because there is oil in that region.Since early 50 Tibet is persicuted and systematic uprooting is happening but none of the western democracies did any thing but lip service to suit their own agenda. They just placate China even after Tinaman Square riots. Wake up befor it is too late. This is shameful for western democracies. They have become so materialistic with trade and commerce that no moral obligation remains for people who are percecuted. China has, since early 50 sytematically occupied and made Tibetans refugees in their own land. They invaded Iraq but would not do anything for people of Tibet.Even people in Chians mainland have no freedom.Remember Tinaman student protest.China is nothing but big bully. Thanks for the connection betw Tibet’s circumstances and where we all may be headed or how we all can choose where we are headed. Please, could you give me a reference for the shelling of the monasteries during the Cult. Revol. ?